Starting this Wednesday, Net Neutrality supporters will raise the alarm in defense of an open internet. Since December of last year — when the Federal Communications Commission voted to strip internet users of their Net Neutrality protections — millions of advocates of every political stripe have been organizing to nullify the ruling and restore the safeguards we expect every time we go online. This week and next, we’re joining with organizations and online companies calling on the Senate to pass a “resolution of disapproval.” If both chambers pass it and the president signs it, the resolution would reinstate the Net Neutrality protections we won in 2015. These baseline open-internet rules prevent companies like AT&T, Comcast and Verizon from interfering with our rights to connect and communicate. But how did we get to where we are today, and what can people do to stop the Trump administration and big phone and cable companies from killing Net Neutrality?Here’s the rundown. How did we lose Net Neutrality? We won Net Neutrality protections in 2015 after a decade-long battle to determine whether internet users or the companies that sell online access would control the internet. A 2015 FCC ruling created the legal foundation for real Net Neutrality, giving internet users the right to choose what they do, where they go and who they connect with online. This victory was an unprecedented win for the public interest against the forces of an immensely powerful corporate lobby that had spent hundreds of millions of dollars on lawyers, PR firms, lobbyists and campaign contributions in a failed bid to take over the internet. But in 2017 the Trump administration put in place a new FCC chairman — former Verizon lawyer Ajit Pai — who from day one declared his intention to do the bidding of phone and cable companies and repeal the historic 2015 rules. On Dec. 14, 2017, Pai’s FCC voted along party lines to dismantle Net Neutrality protections, abdicating the agency’s legal authority to safeguard internet users, and clearing the way for internet providers to block or throttle online content. Pai pushed through this ruling despite the flood of support from tens of millions of people who favored keeping the Net Neutrality protections. He even defied the wishes of his own political base. Poll after poll after poll after poll shows large majorities of Republican voters in opposition to repealing Net Neutrality protections. Pai continues to declare that his decision was based on proof that Net Neutrality rules had hobbled investment and innovation — and yet he’s failed to produce a shred of evidence to support these claims. That’s because none exists. How do we plan to win it back? From the day of the 2017 vote to repeal Net Neutrality, open-internet advocates have fought to restore our rights. Free Press and our allies are taking the FCC to court — challenging its reversal on the proper definition of broadband, its flawed justifications for tossing out the rules, and the many process fouls that plagued the FCC’s 2017 proceeding. Since then we’ve worked tirelessly to build our case against the legal, factual and moral failings that the FCC majority used to prop up its unjustified decision. The suit has been assigned to the U.S. Court of Appeals for the District of Columbia, with oral arguments expected to occur by the end of the year. We’re confident that the judges reviewing the Trump FCC’s wrongheaded decision will rule against its conclusions and the way Pai conducted the proceeding. Meanwhile, members of the House and Senate have introduced a resolution of disapproval under the Congressional Review Act, which would overturn the FCC decision and restore the Net Neutrality rules. The resolution — led in the Senate by Sen. Ed Markey (D–Massachusetts) and in the House by Rep. Mike Doyle (D–Pennsylvania) — has gained hundreds of co-sponsors. Throughout the year, members of Team Internet — a campaign run by Free Press Action Fund, Demand Progress and Fight for the Future — have been rallying outside the local offices of lawmakers to gain support for the resolution. In addition, more than 30 states are weighing legislation to restore the Net Neutrality rules. The governors of Hawaii, Montana, New Jersey, New York, Rhode Island and Vermont have signed executive orders prohibiting their states from doing any business with internet providers that violate Net Neutrality. The mayors of more than 110 cities, representing more than 25 million people, have signed a similar pledge. In early May, the three groups leading Team Internet — which are also behind the organizing hub BattlefortheNet.com — announced “Red Alert for Net Neutrality,” actions designed to drive constituent calls and emails to lawmakers ahead of the Senate vote. The groups are launching the days of action in the expectation that the Senate will soon vote on Markey’s resolution reinstating the open-internet safeguards. 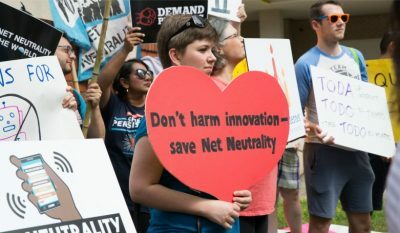 Beginning on May 9 and continuing every day until the Senate votes, internet activists, major web companies, online forums and small businesses will “go red” for Net Neutrality, displaying banners on their websites and via social media, and urging everyone to tell their senators to vote for the resolution. You can get involved by visiting BattlefortheNet.com or Free Press, or by joining Team Internet. All 49 members of the Senate Democratic Caucus, as well as Republican Susan Collins, have announced their support for the resolution, meaning that, at most, just one more vote is needed to ensure passage in the Senate. If the measure passes there, activists will ramp up the fight in the House, where about 160 reps have signed on to a companion bill. Congress has the opportunity to unwind the Trump FCC’s terrible and unpopular decision. You can get your lawmakers to speak up for real Net Neutrality — and to stand on the right side of history — by calling on them to vote for the resolution of disapproval. Tens of millions of people have joined the fight for Net Neutrality. If we don’t raise the alarm now we could lose the one principle that keeps the internet open and available to everyone.